What is a bill of supply? A bill of supply is issued in cases where taxes cannot be charged on the goods or services sold. As a bill of supply is issued instead of a regular tax invoice, the time limits pertaining to issuing invoices apply to the bill of supply as well. When is a bill of supply issued? When composition dealers make a sale. If you are registered under the composition scheme, you will be unable to collect GST from customers, claim ITC, or issue tax invoices. When a business is involved in selling GST exempt goods or services. Exporters should issue bills of supply, since exporting goods is zero-rated under the GST regime. When is a bill of supply not required? The recipient is not registered under GST. The total value of the supply is less than Rs. 200. The header contains the logo, name, GSTIN, and address of your organization. a. 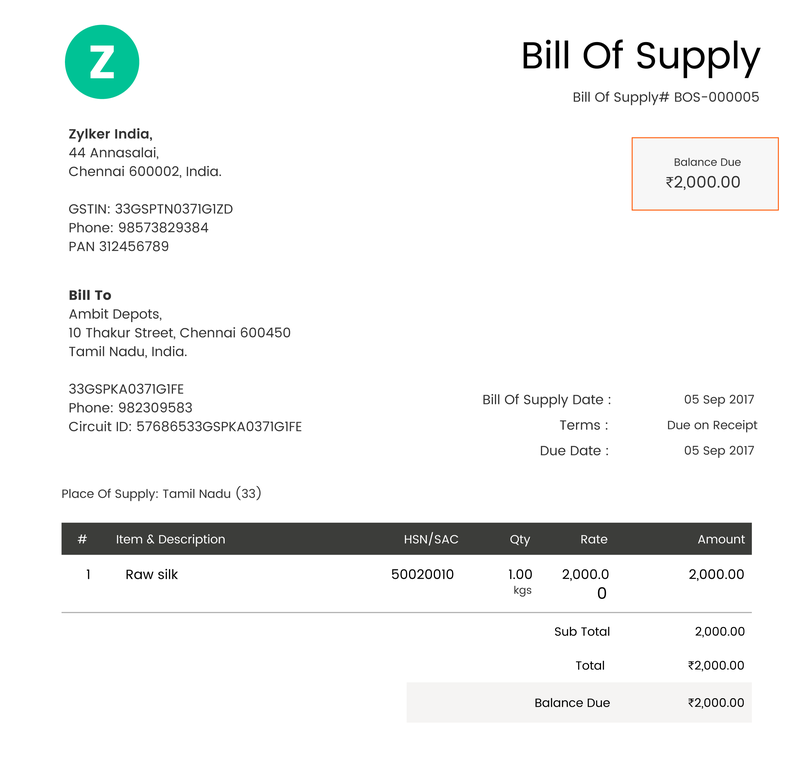 Bill of supply number: This number should be generated consecutively and should be unique. b. Date of issue, state in which the bill is issued, and the state code (the first 2 digits of the GSTIN). Under the Bill to Party section, enter the name, address, GSTIN, state, and state code of the recipient (purchaser). Under the Ship to Party section, enter the name, address, GSTIN, state, and state code of the recipient of the shipped goods. NOTE: If the recipient is not registered under GST, it’s mandatory to mention the name, address and place of supply on the bill of supply for transactions worth over Rs. 50,000. The final section will contain details on the product description, HSN/SAC code, unit of measure (piece/kg), quantity and rate of the product (per item), amount of the product, and any discount offered. The value of supply is then calculated and entered both in number and words. The next section contains your bank details: bank account number, bank IFSC code, and any terms and conditions that are followed by your firm. Finally, the bill of supply is attested with the seal of the firm and an authorized signature.